Day 205: ‘Hats Off’ to another great day . . .
Today we had the privilege of attending a fundraising event for our local Hospice chapter. “Hats off to Hospice” was a great afternoon of food, entertainment and auctions to raise money for Central Texas Medical Center’s Hospice program – Dream A Dream. Dream A Dream is a wish granting program for hospice patients and families. Wishes have ranged from special vacations, family portraits, hot air balloon rides, fishing trips and much more. Every dream is special in its own way. Hospice has been part of our lives and so we really support these men and women who offer care and comfort to those who are winding down their time on earth before being released from their trials and ascending to a better place alongside our heavenly Father. Other than a lot of wind, the skies were deep, dark blue and the sun was at its’ finest! It was a terrific opportunity to not only raise some money, but also to enjoy the beauty of spring that was bursting out all around us . . . and we weren’t even paying attention! 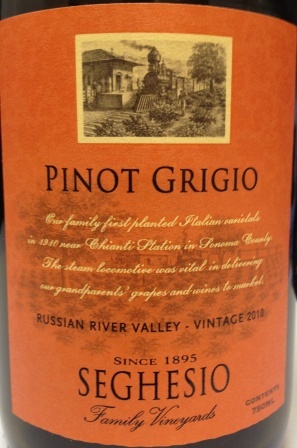 We decided that today should be celebrated with something light and fresh which led us to the wine of the day, so we opened and enjoyed a 2010 Pinot Grigio from Seghesio Family Vineyards in Healsdburg, California. Having visited this place back in 2008, (reference Wednesday night’s blog–March 20th) we knew that we were in for a real treat. We tasted a crispy, juicy apple with lots of pears and apricots in the background. The wine was fresh, yet had structure; it was fruity, but it tasted really good with a nice finish! Remember – we are not big fans of white wine . . . so it has to be pretty darn good for us to even pop the cork! This is a wine that would go really well with roasted chicken or even pasta. We enjoyed it with oven-roasted boneless chicken thighs in a crushed saltine cracker and Hidden Valley Dressing mix rub. Served with steamed broccoli and fresh corn on the cob, the wine was a natural with the fresh flavors and the earthy textures. It’s Sunday night, so we’re getting ready for another week and also getting ready for Easter. It’s a special time of the year, but we only get to see Daughter #1 since the time off allotted for Easter is a mere fraction of what’s allotted for Christmas. It’s a real shame that one of the MOST important and Holy Days of the year gets virtually no recognition or respect for people’s time off. We’ll miss having Daughter #2 for our annual celebration of Chinese food and great wine! Alas, we’ll be forced to carry on without her, but know that she’d want us to make the most of the special day! Seghesio Family Vineyards is an amazing company. Having started their wine making business over 100 years ago, today they are still family owned and operated and getting ready to add the fourth generation of family members to the business. It’s something that gets lost in American business today–family companies that get passed down from one generation to another – legacies that get lost in a sea of paper work and money grabbing. We salute the Seghesio family for their continued excellence in wine making. To the folks at CTMC, we hope that your day was wildly successful and thank you for allowing us to be a part of it! Until tomorrow, please enjoy your favorite wine responsibly and remember to recycle whenever possible. Categories: Uncategorized | Tags: Hats Off for Hospice, Pinot Grigio, Seghesio vineyards | Permalink.